If you feel stuck in a dead-end job without a college degree, you may be thinking “What’s the fastest, most convenient way to make more money?” You don’t just want a job – you want a career. If you entered the workforce with only a high school diploma, you realize the first step in going from job to career is your education and credentials, but you may not be ready quite yet to take the risk of quitting your job to pursue a traditional degree full-time. You need your job, after all. But there’s good news on that front – it’s not at all necessary to quit your job, and it’s not even necessary to get a bachelor’s degree to get a secure, well-paying job that can be an entry point into a life-long, rewarding career. According to IPEDS, nearly 3 million students in the US are in fully online postsecondary programs (associate’s and bachelor’s), including hundreds of thousands of working adults who are completing a degree online while working in their chosen career. If you haven’t checked out the higher education scene recently, you may not realize that online degree programs have become just as reputable and marketable as traditional on-campus degrees. Colleges and universities all over the US, from small liberal arts colleges to the very top public and private research universities, have developed online programs specifically with working adults and aspiring professionals in mind. An associate’s degree that can get you into the career of your choice can be as close as your local community college, or as close as a world-famous university 1000 miles away. They’re both the same distance – the computer you’re reading this on. According to LinkedIn, the fastest-growing sectors in the American job market are technology, finance, and healthcare. That shouldn’t be any surprise to working adults who are paying attention to how the world is changing. Virtually every aspect of modern life is dependent on computers, so the growth in IT, from tech support to programming and data analysis, is a given. The world economy continues to grow, and globalization is only increasing the speed and extent of that growth, making jobs in accounting, investment banking, and other finance areas a sure bet. And with the largest American generation entering into retirement and old age, and an increasingly complicated insurance system, there’s no end in sight to the increased need for nurses, doctors, and medical secretaries – all the people who keep the healthcare system humming. You can find your way into any of these career paths with just an online associate’s degree from an accredited college or university. 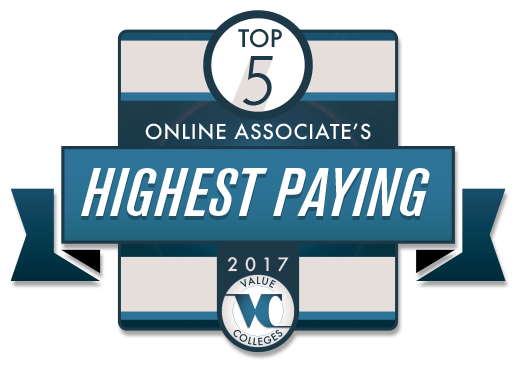 That’s why Value Colleges has put together this helpful list of the top-paying jobs you can obtain with nothing more than an online associate’s. This is not an exhaustive listing – there are many ways into a rewarding career. But this Top 5 is an entry point for you – Value College’s way of showing you that there’s hope and a way forward that is within your reach right now. With cybersecurity at such a priority, it should be no surprise that the field is one of the fastest-growing (18% according to the BLS). There is no way to really estimate how important Information Security Analysts will be in the future, but we know there aren’t enough of them. Colleges and universities are working to fill the gap, however, with a huge growth in online Information Security and Cybersecurity programs, and an associate’s degree can be all you need to get an entry-level position in the field. The median salary for an Information Security Analyst is around $90,120. You will probably not get a job paying that much with only an associate’s degree, but even the low range of Information Security positions, $51,000, is well above the national average. The complexity of 21st century global business has made a hero of the once-humble accountant. There’s simply more need than ever for qualified, capable, and ethical accountants to handle all of the ins and outs of taxes, financial regulations, international trade, and banking and investments. Who are the grunts in the trenches keeping track of the numbers? The accountants, that’s who. As the world economy grows, so does the need for number-crunchers. As government regulation increases and changes, there is more need for the watchful eyes of accountants. It’s not a job everyone can do, and those who do it well see the reward. Accountancy is a nearly bullet-proof occupation. The Bureau of Labor Statistics expects a higher-than-average 11% job growth for accountants between 2014 and 2024, and that may even be conservative, as the BLS themselves acknowledge; there’s no sure way to predict how the economy may grow, how tax laws and regulations may change, and how new players in the world economy will affect the need for the people who keep it all in check. An associate’s degree is the quickest way into an entry-level corporate or bank job. Once in your career, an online bachelor’s can help professionals earn promotion and ever-higher salaries. Modern business moves fast, and employees come and go; according to LinkedIn, the average employee turnover rate for all American industries is 15% – and much higher in some fields, such as hospitality. That makes the Human Resources Specialist an indispensable part of any corporation, government agency, or non-profit organization. They are the people who see new employees in, see them through, and, when necessary, see them out. They handle benefits, training, and regulations, and they troubleshoot any problems employees have with their compensation. They are the people who know. An entry-level position in Human Resources is there for the taking with only an associate’s degree, and community colleges and universities are taking notice with online associate’s programs in the field. The BLS sees an average level of growth in the career at 5%, and while the higher-paying positions may require a bachelor’s degree, those are easy to find online as well while already working in your Human Resources career. Median pay is $58,350, and as you work your way up, there can be very satisfying pay rates for the Human Resources Specialists who save their company money and keep that turnover rate low. When every sector of the world economy depends on computers, that makes the people who provide support and maintenance at the local user level absolutely essential. There is a place for IT Specialists in virtually every corporation, agency, organization, and school in the US, though they may go by many names – throw the words “IT,” “computer,” “network,” “support,” and “specialist” into a hat, pull out two or three, and you’ll create one of your own. But whatever they’re called, no modern company can function without them. They do everything from troubleshooting computer problems, to keeping data backups, to training employees on using the company’s systems. The BLS sees growth in the broad category of IT Specialist at 12% from 2014-2024, considerably above average, and while there is some concern about low-level tech support jobs going oversees, most really intensive IT work needs to be done on-site, or at least by employees who can visit on-site. An associate’s degree is enough for entry-level positions at most organizations, and while continued education (in the form of workshops or certifications) is usually considered a must for any technology job, many people can progress in an IT career without even making the jump to a bachelor’s degree. We generally think of the boom in healthcare as meaning more opportunity for nurses and doctors, which is definitely true, but don’t forget the importance of Medical Secretaries. Anyone who has called a doctor or dentist’s office and encountered a bad secretary knows exactly how valuable a good one is. Whether they are processing payments or organizing patient records, the Medical Secretary has the responsibility of making sure a clinic runs smoothly for the patients, nurses, and doctors alike. The BLS sees jobs in this area growing at a well-above-average rate of 23%, thanks to the increased demands for organization and compliance with our complicated insurance system. Salary can vary – the median in 2015 was $33,040, but Medical Secretaries can make considerably more, approaching $50,000 (dentist’s secretaries seem to make the most, if that’s important to you). The best part, for an aspiring office professional, is that an associate’s degree is really all you need to begin a career as a Medical Secretary. In fact, many working adults who have experience in a clerical position may only need on-the-job training to switch to a healthcare setting, but a specialized AS degree, which you can get online while working in another position, is going to make you stand out. * It’s important to realize that in these careers, the highest-paying positions will probably require a bachelor’s degree, but that’s the great thing about 21st-century education: you can earn an online associate’s degree to get in the door, and continue working toward an online bachelor’s degree for promotion. And once you are employed, many companies will pay or offer incentives for further schooling for employees who show potential – you may be able to get your bachelor’s completely paid for, in fact.